Australia’s booming economy may be about to go bust. Here’s why. Source: Wikimedia Commons, Car money. Australia's economy is the 12th largest in the world and in the past five years, its GDP has shot up 65%. But bigger isn't always better, and there's one major threat to Australia's expanding economy. Here's what you need to know. Australia's economy isn't booming on the backs of kangaroos or koala bears. It's growing from down under -- literally. Australia's mining sector has been pouring money into the ground for the past decade, and it's paid well. Iron, coal, uranium, and natural gas production have all turned Oz into an impressively rich country. Australia is one of just three OECD countries that is a net energy exporter, due primarily to coal and liquefied natural gas (LNG). The country claims the title of fourth-largest producer in the world for both coal and LNG. Peabody Energy Corp. (NYSE:BTU), the world's largest private coal company, is heavily invested in Australia's economy. In 2012, the company saw Australian sales volumes increasing an astonishing 30% to 33.0 million tons. Even with softer coal prices, Australian revenue accounted for 43% of the company's $8 billion in sales. Not to be outdone, mega-miner Rio Tinto (NYSE:RIO) announced this month that it had broken its own records. Four of its Aussie coal mines achieved new annual production highs, and the company contributes a laundry list of commodities to Australia's economy: uranium, aluminum, copper, iron ore, gold, diamonds, and even salt. Source: Rio Tinto PLC; Australia Operations . But the mining boom may be about to go bust, according to Deloitte Access Economics' quarterly Business Outlook report. As mining investment eases off, Deloitte expects economic growth to slow as unemployment creeps higher. "Recent years saw a deluge of development dollars go into the resources sector," the report notes, as reported recently by The Sydney Morning Herald.. "But those dollars have already peaked, and the key question is just how fast or slowly the bonanza of recent years unwinds." Powerful dollars don't do much good in a weakening economy. Mining may have expanded Australia's economy, but it also gave it an Achilles' heel. The rest of Australia's economy has been struggling to keep up with the mining sector's price push. Domestic costs for Australian producers have headed higher as its citizens' standard of living has soared. Aussies earn around $13,000 more than the average American, and nearly double that of their neighboring New Zealanders. 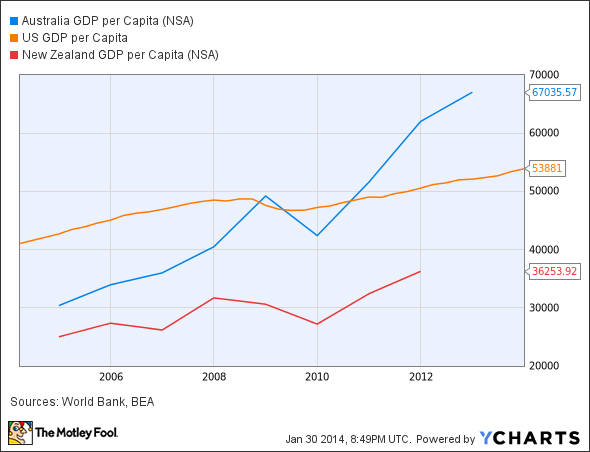 Australia GDP per Capita data by YCharts. For export-oriented companies, their pricier products have struggled to maintain global competitiveness. And locally, Australians are increasingly choosing cheaper import products over those produced in-country. Australia's largest producer of premium fruit, SPC Ardmona, has seen sales plummet in the past few years. The 90-year-old company has watched from the sidelines over the last five years as its market share of private label canned fruit has been squeezed to 33% while exports have nosedived 90%. "We are not competing on a level playing field against the overseas sourced private label products," said Managing Director Peter Kelly in a statement as he sought approval for a temporary subsidy. "We are competing against products from countries that have considerably lower labor and production costs and arguably lower quality standards than we have in Australia." This week, the Australian government turned down an A$25 million ($22 million) grant request to help the company retool its facilities. Ironically, the slowdown of Australia's economy may be a blessing in disguise. Economic growth is oozing, its dollar is dropping in value, and Aussies will likely be in for a tougher time in the next few years. But the country needs to quit its mining addiction, and the sooner it pulls its head out of the ground, the better.